Enjoy the many beauty tips offered by our team of experts for using your mineral makeup, lip colors or your favorite skin care products. Our Beauty Tips are not only created to teach something new and inspiring or even beneficial, but to provide you with some money saving tips as well. We also will share any beauty tips offered by our customers on how they best used their mineral makeup for a desired look or choosing the best lip color, or their skin care for the best results. So if you have some great ideas you wish to share with us too, let us know! We love helping our customers with the best beauty tips available so you can get the most from your minerals, lip colors and / or ONATI Skin Care. So come back and visit us since we update this page often with extended new articles, so you can always achieve great results and look years younger, and you may even fall in love with some great skincare recipes. Just Click on the titles below for complete Beauty Tips. We have dedicated an entire category to just eyeshadows since the workings of the color palettes are so diverse and women enjoy being creative. Not only will we provide tutorials, but we will provide assistance with color matching a certain look you just love from our large selection of eyeshadow shades. ENJOY! A first time purchase of mineral makeup and organic skin care products can be a daunting task, yet we make it simple for you. We offer samples in our mineral makeup products and can assist you with any question you might have. Plus in our Education Center we offer a multitude of articles to answer just about any question you have. Happy Shopping! Did you just get a brand new lipstick or are you still using your favorite lip color when suddenly... it BREAKS! Well we will advise you on the best way to avoid a break in the first place, yet if the unthinkable happens and you suffer the heartbreaking breakage, we'll teach you the easiest and simplest way to fix that beautiful shade of lipstick. 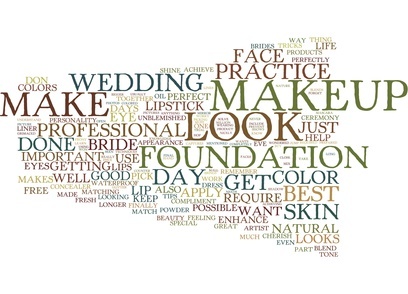 Looking beautiful on our wedding day is essential and it is why using the best mineral makeup is a must. We keep it simple, yet the finished look is flawless and can be worn everyday. Achieve this gorgeous bridal look recreated with our the mineral makeup collection. Flash photography is no problem either with our minerals. Trying to figure out how to choose the best mineral makeup brand for your teenage daughter? We can show you the best way to get started and what products will be the easiest to use for her. Less is more, yet she will shine with confidence with a natural beauty that will dazzle her socks off. Mineral makeup products can definitely create a blurred or soft focus illusion. However, application is key to getting the best results. We explain the reality behind the soft focus premise and what you can expect when using mineral powders and its' not based on the marketing hype you see on television. When dealing with mineral makeup, some of us can still struggle to find the perfect blend for our sensitive skin. Whether you have perfect skin or skin plagued with problems, not all mineral makeup is the answer to that problem as all mineral makeup products are not alike. Learning how to apply mineral makeup powders does not have to be difficult. We show you best technique for getting a beautiful finish to your skin, yet we include several ways to you can go about it. Simple, easy and goof proof so you can get on with your day. Dewy cheeks give the appearance of youth and vitality. With this simple trick using one of our lovely eyeshadows, you too can restore a youthful, lovely polished glow to the face. Never worry about your face looking shiny or oily. The finish will be nothing short of perfection. We get so many questions on how to use mineral powders to cover up or neutralize redness, cover a pimple or reduce the appearance of scars, we thought it was time to give some tips on how to best accomplish this. When dealing with areas of redness on the face, using mineral makeup in the correct way will provide nice coverage and will reduce redness, making your face flawless and youthful once again. Plus you enjoy the added bonus of reduction in irritation and light coverage so as not to further promote occlusion or aging of the skin. Have you ever noticed that when you use green color correcting makeup to conceal redness or cover a pimple, whether it is liquid or mineral makeup, the area actually appears greenish gray? We have the answer to this weird phenom. When applying bronzer, some women aren't sure of when is the best time to apply it during the mineral makeup process. For instance, do they apply it before or after blush? Or can it replace blush altogether? Video Tutorial Included! The Moist Method is always the preferred method for applying our mineral makeup foundations. Picking the mineral blush up with a damp brush can cause streaking or blotchy color on the cheeks. That is why we have created this beauty tip for using our mineral makeup blush to yield the best results. As skin matures and wrinkles increase on neck and chest areas, there is a very simple thing you can do to cool, soothe and reduce irritation which occurs in the folds of the skin. Mineral Veil has a remarkable use for keeping those areas in good condition including making skin feel and look better. As our skin deepens with exposure to the sun in summer time, keeping a light touch with your mineral makeup shade is important to looking natural and not like you're wearing a mask. These simple beauty tips will help you to naturally change your skintone to keep you looking beautiful. These excellent facial care tips will help you control what seems to be the never-ending zit that occurs in the hottest months of the year. Facial care plays a huge role, yet how you use your mineral makeup products is also key to saying goodbye to summer time acne.